We have seven cabins nestled amongst the tall timbers right on the lakeshore, each with its own deck over-looking the water, propane barbecue at no extra charge, fire-ring and private wharf. Echo Lake Resort cabins comes with electricity, gas fireplaces or a wood-burning stove, cold running water, a fully-equipped kitchen, picnic table on the deck, a private outhouse and access to our central wash-house with hot showers and flush-toilets. Keep in mind these are ‘housekeeping cabins’, please bring your own bedding, pillows, bath/beach towels and dish cloths. 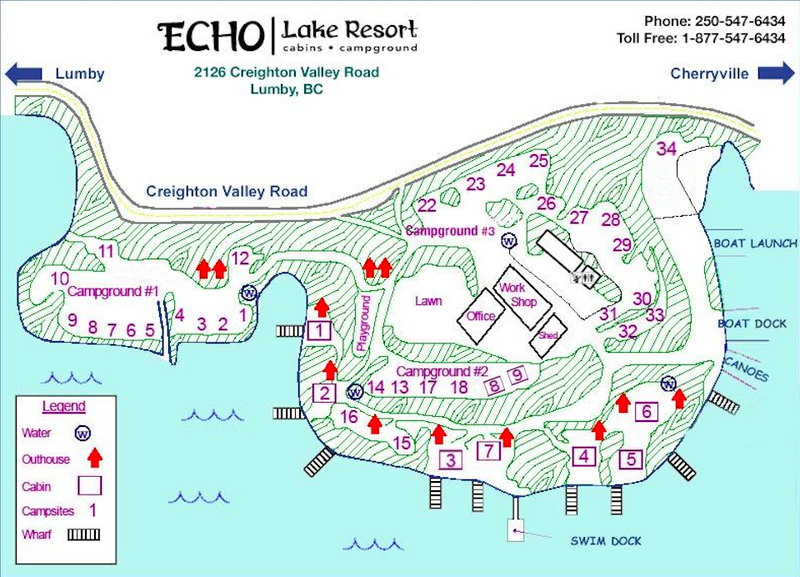 Click on the Resort Map for an over-view of cabin and campground site locations. Our rates are based on double occupancy, during long weekends and peak seasons we do require a 3 night minimum booking. Please fill out our simple request form to inquire about availability. Click here to see cabin gallery & floorplan! Cabin One can accommodate up to 2 adults and 2 children max. The Cabin is only 20ft to the waterfront and your private dock. There is a firepit and chairs, and a picnic table with BBQ on the deck over-looking Echo Lake. Cabin Two can accommodate up to 2 adults and 2 children max. It’s only 20ft to the waterfront and your private dock. A firepit and chairs are yours to enjoy along with a picnic table and a BBQ on the deck over looking beautiful Echo Lake. Cabin Three can accommodate up to 4 adults and 2 children max. A few steps lead you down to the waterfront and your private dock. There is a firepit and chairs to enjoy, with a BBQ and picnic table on the covered deck looking out over Echo Lake. Cabin Four can accommodate up to 4 adults and 4 children max. The Cabin is mere steps to the waterfront and your private dock. There is a firepit and chairs, picnic tables and a BBQ on your deck over-looking Echo Lake. Cabin Five can accommodate up to 4 adults and 2 children max. The Cabin is only steps to the waterfront and your private dock. There is a firepit and chairs, and a picnic table with BBQ on the covered deck over-looking Echo Lake. Cabin Six can accommodate up to 4 adults and 2 children max. The cabin is only 20ft to the waterfront and your private dock. There is a firepit and chairs, and a picnic table with BBQ on the deck over-looking Echo Lake. Cabin Seven can accommodate 2 adults max. The Cabin is only 20ft to the waterfront and your private dock. There is a firepit and chairs, and a picnic table with BBQ on the deck over-looking Echo Lake. **New to Echo Lake Resort 2017! Cabin 8 and 9 can accommodate 2 adults and 2 children max. These Cabins are a 2 minute walk away from the beach and both offer gorgeous partial lake views. There is a firepit and picnic table, and each cabin is equipped with one double camping mattress in loft (for up to a maximum of two children only – not appropriate for adults) and one double bed below along with a table and 4 chairs. Perfect for new campers, families transitioning their young to the camping lifestyle, or just those who prefer to skip the morning tent condensation (smile)! Please be aware that these are only simple cabin shells and there is no kitchen/cooking equipment, water supply, electricity, or heat source inside.